We all want to live our lives with a full set of natural, healthy, beautiful teeth. Sadly, that is not possible for everyone. Sometimes our teeth just don’t last. Either due to poor home care, or external forces over which we have no control, or both, people find themselves facing the loss of one or more teeth. Dental crowns and bridges can help preserve and even improve a person’s smile and oral health. Dental crowns are artificial caps that replace a damaged or unattractive tooth cemented permanently to the healthy root of the tooth. They are made of various materials designed for strength and aesthetic appearance based upon the location of the teeth and the needs of the patient. They are also used to complete a root canal treatment, cap a dental implant, or for cosmetic purposes to improve the appearance of an imperfect natural tooth. Common materials used for dental crowns are gold, metal alloy, porcelain, porcelain fused to metal, ceramic, and zirconia. They all have different advantages and disadvantages. At Precision Dental, we guide you in determining which crown will be best suited for your needs and desires. Dental bridges are artificial teeth that are designed to fill gaps left by missing teeth.When a tooth is lost, not only does it leave an ugly gap, but it also negatively affects the surrounding teeth which lose the support and stability provided by the former tooth. The adjacent teeth will shift over time and this can alter facial appearance. To avoid this problem, it is necessary to install a dental bridge to fill the gap and provide stability to the remaining teeth. The adjacent healthy teeth are given dental crowns. An expertly made dental prosthetic is custom crafted at a dental lab. A temporary bridge is installed while the permanent one is being constructed. When the permanent bridge is ready, the temporary bridge is removed and the permanent one is attached to the adjacent dental crowns. With proper installation and consistent, diligent home care, a dental bridge will provide trouble free service indefinitely. The materials used for dental bridges are the same as for dental crowns (gold, metal alloy, porcelain fused to metal, ceramic, and zirconia). 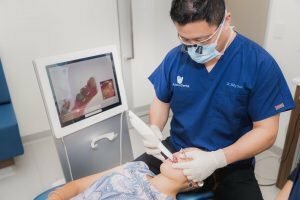 Dr. Choi will discuss the advantages and disadvantages of each type to help you determine which one will offer the highest quality, superior aesthetics, and greatest value for your investment. At Precision Dental we offer the most advanced designs and finest materials in dental replacements. 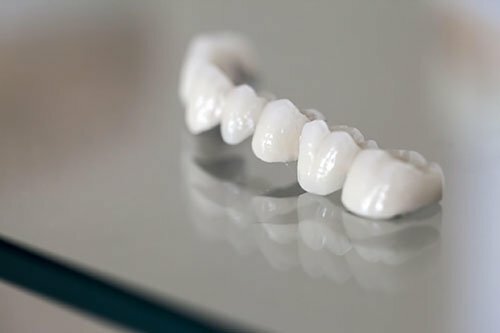 With over a decade of experience in providing dental crowns and bridges, we will present you with all of the options and offer you professional recommendations so that you can decide what will best suit your particular needs. Our goal at Precision Dental in the greater Brisbane metropolitan area is to provide our customers the finest dental service possible. We provide the highest quality dental treatment, combining your needs for long lasting, robust dental replacements with your desire for a dazzling smile. We offer the most modern, effective, pain-free dental services and will provide you with the most convenient and comfortable dental treatments possible.